On average, a person with hearing loss waits 7 to 10 years before visiting a hearing healthcare professional for diagnosis and treatment. However, there are several compelling reasons why you shouldn’t wait. Doing so hinders your ability to experience life to its fullest and causes an unnecessary burden on your relationships with friends and family. Taking action early is also good for your overall wellbeing, as untreated hearing is linked to many other serious health concerns. Continue reading to learn about 10 major health conditions that have been connected to untreated hearing loss. Researchers have found that a higher body mass index (BMI) and larger waist circumference are associated with a higher risk of hearing loss. 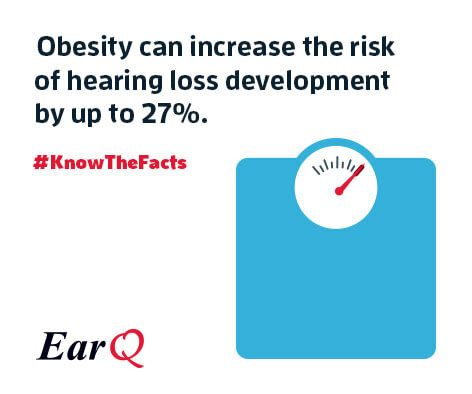 They have also found that the risk of developing hearing difficulties increases by up to 27% for people who are overweight. A separate study discovered that obese teenagers are more likely to develop hearing loss than their peers with lower BMIs. Overweight and obesity ranges in adults are measured using a person’s weight and height to compute their BMI. The BMI is used because, for most people, it correlates with the amount of fat in their bodies. A BMI of 25-30 is considered overweight, and a BMI over 30 is considered obese. You can use the CDC’s online tool to calculate your BMI here.